Series 13 ‹ Flog It! Flog it! comes from Birmingham Museum and Art Gallery. Flog it! comes from Southwell Minster in the town of Southwell near Nottingham. Flog it! comes from Wallasey Town Hall on the Wirral Peninsula. 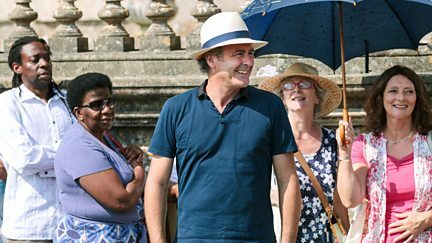 David Fletcher and Catherine Southon search for antiques at Lulworth Castle in Dorset. Mark Stacey and Michael Baggott search for antiques at Southwell Minster. Paul Martin presents a collection of the best finds from the show's travels. Paul Martin visits Chartwell House, home of Sir Winston Churchill. Paul Martin presents from Hopetoun House, not far from Edinburgh. In Gloucester, finds include a rare cameo lava brooch and a Tibetan ceremonial instrument. Paul Martin presents from Wrest Park, a Georgian manor house in Bedfordshire. Paul Martin presents from Lulworth Castle in Dorset, with David Fletcher and Mark Stacey. Treasures include a fantastic collection of war medals and a unique funeral invitation. Paul Martin presents from Wallasey Town Hall on the Wirral Peninsula. Paul Martin presents from Gloucester, with Philip Serrell and Michael Baggott. At Hopetoun House, Adam Partridge and Caroline Hawley find some fascinating antiques. Treasures include a 1920s gold vesta case and a painting by Albert Moulton Foweraker. Victorian jelly moulds and an exquisite French snuff box are brought in for valuation. Paul Martin introduces a collection of the best finds from the show's travels. Paul Martin presents from Southwell Minster in the town of Southwell, near Nottingham. Paul Martin presents from Wrest Park, with experts Christina Trevanion and David Harper. Paul Martin presents from Chiddingstone Castle in Kent and visits Hever Castle. A collection of the best finds from the show's travels round the country. Paul Martin presents from Birmingham Museum and Art Gallery. Catherine Southon and Mark Stacey search for antiques at Lulworth Castle in Dorset. Paul Martin discovers the architectural history of Hopetoun House, not far from Edinburgh. Paul Martin presents from Gloucester, with experts Philip Serrell and Michael Baggott. Paul Martin presents from Birmingham, with antiques experts James Lewis and Thomas Plant. Paul Martin presents from Wrest Park with experts Anita Manning and Christina Trevanion. Paul Martin presents from Chiddingstone Castle, with Thomas Plant and Adam Partridge. Paul Martin presents from Wrest Park, with experts Anita Manning and Christina Trevanion. Paul Martin presents from Southwell Minster, with experts Caroline Hawley and Mark Stacey. A collection of the best finds from the show's travels around the country. Paul Martin presents from Birmingham, with experts Christina Trevanion and Thomas Plant.